HAVANA/LA PALMA , Mar 30 2016 (IPS) - The United States has indicated a clear interest in buying organic produce from Cuba as soon as that is made possible by the ongoing normalisation of ties between the two countries. But farmers and others involved in the agroecological sector warn that when the day arrives, they might not be ready. “The impact would be conditioned by several factors, including the capacity of farmers to design, implement and evaluate agroecological business models that can meet the demands and requirements of the domestic and international markets,” Humberto Ríos, one of the founders of the green movement in Cuban agriculture, told IPS. The possible opportunities offered by the big U.S. market, where requirements are strict, will test the response capacity of the country’s organic farmers. “The farmers know how to grow things without agrochemicals. But that’s not enough for developing agroecology,” said Ríos, a researcher who is now working in Spain at the International Centre for Development-Oriented Research in Agriculture, told IPS by email. Cuba needs “a clear policy to boost the economic growth of the private sector and cooperatives interested in offering agroecological products and services,” said Ríos, who won the Goldman Environment Prize, known as the Green Nobel, in 2010. Ríos also won a prize for his work in the Programme for Local Agrarian Innovation (PIAL), which with the help of international development aid has taught participative seed improvement and other ecological agricultural techniques to 50,000 people in 45 of Cuba’s 168 municipalities since 2000. Ríos also said Cuba’s new economic openness could have either a positive or a devastating impact. 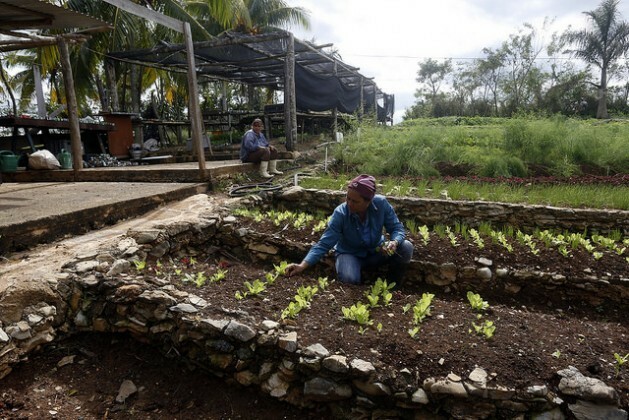 Experts describe Cuba’s agroecology as a “child of necessity” because it was born after this country lost the agricultural inputs it was guaranteed up to the collapse of the Soviet Union and east European socialist bloc at the start of the 1990s. If measures are not taken and pending issues are not solved, “the invasion by conventional agriculture and its products is likely to erase more than 25 years of agroecology,” Ríos said. There have been several U.S.-driven initiatives to create open ties in agriculture, since the thaw between the two countries began in December 2014. And the climate is even more positive since U.S. President Barack Obama’s historic Mar. 21-22 visit to Havana. In the mountainous municipality of La Palma, where Ríos began to work as a young man with a handful of small farmers in this locality in the extreme western province of Pinar del Río, green-friendly activists already feel the looming threats. “The surge in improved seeds is a weakness,” said Elsa Dávalos, who belongs to the National Association of Small Farmers of La Palma and coordinates the local agroecological movement, where 500 of a total of 1,127 farms grow their produce without using chemical products. 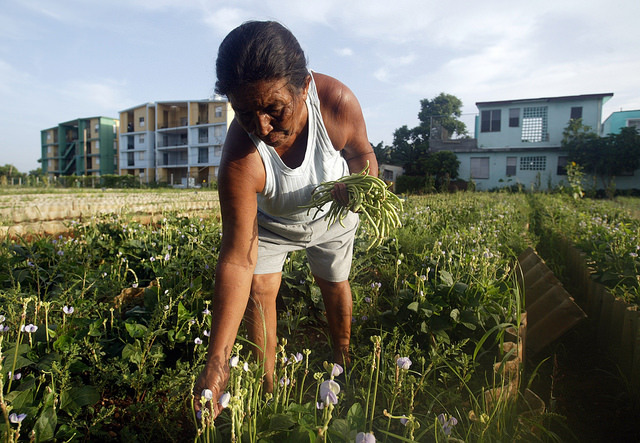 Cuba’s statistics on organic food and agroecological farms are scarce and scattered among different municipalities and programmes. The national initiative that most frequently provides figures is the National Programme of Urban, Suburban and Family Agriculture, which promotes organic gardening in towns and cities. A total of 8,438 hectares are now cultivated under urban farming, including 1,293 small organoponic farms (which combine organic and water-submersion hydroponics techniques), tended by day laboureers; 6,875 hectares of intensive gardens (identical to organoponics but without walled beds); and 270 hectares of semi-protected crops (covered by screens on poles). In 2015, patios and yards in urban and suburban areas produced a total of 1,257,500 million tons of food, mainly vegetables, 2,500 tons less than the year before. Dávalos said the improved seeds she was referring to are crops given high priority, such as maize, beans or taro, whose seeds are distributed along with a package of agrochemicals. “Many farmers go this route to get big harvests without having to work so much,” she lamented in her conversation with IPS in La Palma. Improved seeds became more widely used after the government of Raúl Castro launched economic reforms in 2008, with a focus on increasing agricultural production to reduce food imports, which cost this island nation two billion dollars a year. Up to now, the measures applied, such as the distribution of idle state land to farmers in usufruct, have brought modest growth in agriculture – 3.1 percent in 2015 – considered insufficient to meet domestic demand and to bring down the high, steadily rising prices of food. Farmers complain about a lack of inputs like fertiliser, machinery and irrigation systems, a shortage of labour power, limited access to complementary services, red tape, and weak industrialisation, to preserve and sell surplus crops, for example. Ecological farms struggle against these difficulties common to the entire agricultural industry, and others particular to green-friendly farming. “It is very hard for small (organic) farmers to attend to all of their responsibilities and to also find time to produce the necessary ecological inputs,” Yoan Rodríguez, PIAL coordinator in La Palma, told IPS. To boost yields, “some people must specialise in obtaining only inputs such as efficient microorganisms, compost and earthworm humus,” said the researcher, who is pushing for an improvement in agroecological services in the area, to support and attract farmers. “Cuba has started to open up to the world, and even more so as a result of the negotiations with the United States. The chemical inputs that saturate the global agricultural market will also arrive. It’s going to be very difficult to maintain what we have achieved through our efforts over so many years,” he said. Other factors that discourage the movement in the country is the virtual absence of certification of agroecological products, and a lack of differentiated and competitive prices for organic products in state enterprises, to which cooperatives and independent farmers are required to sell a large part of their production. But PIAL and other initiatives are coming up with new strategies to take advantage of the opportunities opening up with the country’s economic reforms and reinsertion into the international markets. The Marta farm, located in a privileged position between the capital and the special economic development zone of Mariel, in the western province of Artemisa, produces fresh vegetables without using chemicals, and its clients include 25 upscale restaurants in Havana. “We have a good connection with the markets and we sell enough,” said Fernando Funes-Monzote, another founder of the agroecological movement in the country, who in 2011 launched this farm, where 16 people currently work. “The idea was to show that an ecologically sustainable, socially just and economically feasible family farming project was possible here,” he told IPS. Push for openness from interests in the U.S. Meanwhile, interest in Cuba’s ecological agriculture has been reiterated during visits to this Caribbean island nation by U.S. businesspersons and agriculture officials, who are among the most active proponents of a total normalisation of relations between these two countries separated by just 90 miles of ocean. 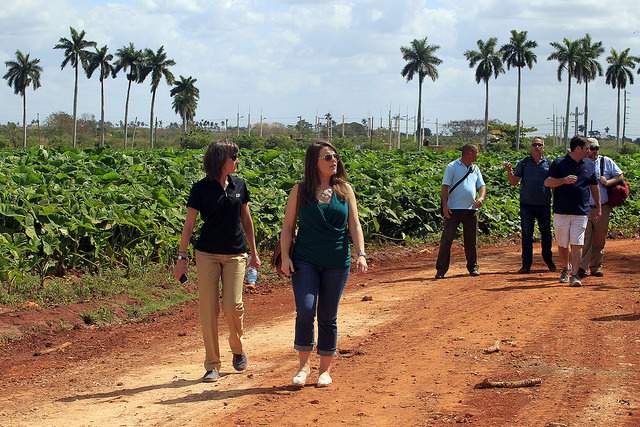 The foremost example is the 30 companies forming part of the U.S. Agriculture Coalition for Cuba (USACC), which emerged in January 2015 to help push for an end to the U.S. embargo against Cuba in place since 1962. The U.S. Agriculture Department even asked Congress for financing for five officials to work full-time in Cuba, to pave the way for trade and investment to take off as soon as the current restrictions are lifted. It is also significant that the first U.S. factory to set up shop in Cuba in over half a century, after getting the green light from the U.S. government in February, will be a plant for assembling 1,000 tractors a year, to be used by independent farmers. The plant will operate in the Mariel special economic development zone. A loophole to the embargo dating back to the year 2000 permits direct sales of food and medicine to Cuba by U.S. producers, but strictly on a cash basis. However, in the past few years these sales have dropped because Cuba found credit facilities in other markets. In 2015 food purchases by the United States amounted to just 120 million dollars, down from 291 million dollars in 2014, according to the U.S.-Cuba Trade and Economic Council. With reporting by Patricia Grogg in Havana. I imagine capitalism will come as an enormous shock to Cubans. Never have they had to do a cost/benefit analysis before embarking on a project. Their outcomes in some areas have been great (nutrition, medicine), but not so hot in others (automotive design and production. architecture). May you live in interesting times; this is one.